"Afoot, lighthearted, I take to the open road. Healthy, free, the world before me." The best moments, the kind that makes me acutely aware about the pleasure of being alive--happens on the road: booming past Southwest buttes with the west wind shoving the car and a huge blue sky overhead. Tunneling beneath a chromatic woodland of aspens somewhere in the Sierra Nevada mountains, winding along the hairpin curves of the California coast, with the sea stacks shimmering in the Pacific mist. Driving in awe under walls and canopies of centuries-old giant trees, miles of dirt roads that seem to go on forever, until it ends in the promised view. Nothing brings the world back to a personal dimension better than a drive on the open road. They say who you travel with is just as important as where you're traveling to. When you pack a handful of good friends, or your family in a speeding vehicle winding down majestic scenery, there is no escape from one another. There is nothing to distract from the pleasure of one another's company and the conversation except for the beautiful landscape unfolding before you. All you have is each other, your stories, and the promise of the destination that lies ahead. 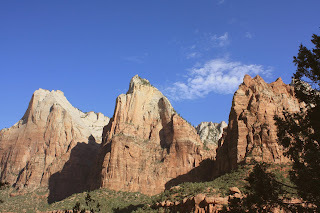 This week, I am driving with my family to explore the last remaining California terrains on our list. Worthwhile stories, design notes and scenery when I get back. 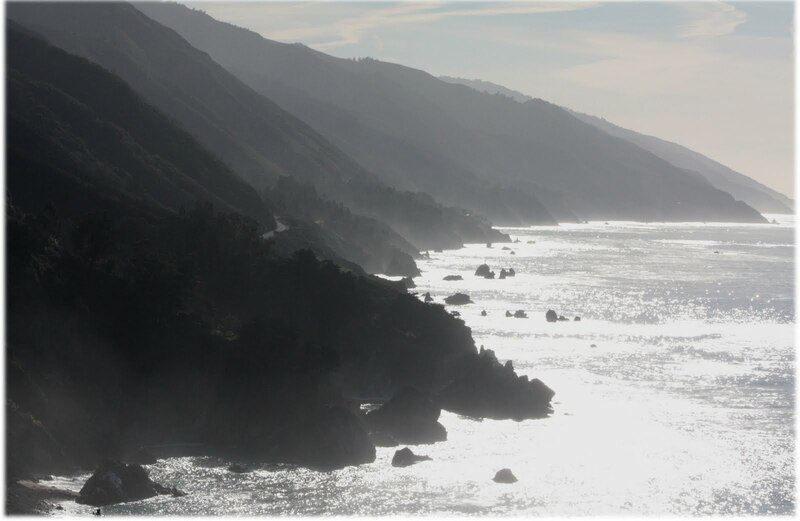 Above: The misty splendor of the Big Sur coast. 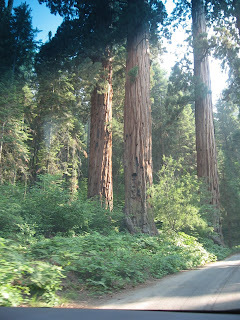 Right: Driving through the Giant Forest at Sequoia National Park. Below: The majestic sandstone buttes of Zion National Park in Utah. For Father's Day, I thought of doing a feature on recliners. Here instead, are thoughts on the recliner that changed my life. There are a lot of other things my dad didn't tell us how to do. He didn't tell us not to smoke, or not to squander your money. He didn't tell us not to lose yourself in your job. He didn't tell us not to value things more than people and relationships. He didn't tell us not to overeat. He didn't tell us many things. He did not like to tell. He spoke very little, and when he did you can almost be sure it was either a simple question he would use to see if you're where you're generally supposed to "be," or it was one of his corny jokes. He seldom berated us, and when we made some poor choices, he did not fling it to our faces but we knew how disappointed he was, and that was more effective than any sermon he could ever belt out. The genius of his fatherhood it seems to me, is that he knew us so well that nothing we ever did really surprised him. It was like he already expected it. He spoke very little, but his actions said a lot. He had shown us what and what not to do, how to do it, and no more words needed to be said. He was quiet but not speechless. When he finished saying what needed to be said, he stopped talking. There are a lot of things he did not tell us how to do. He merely did it. For a while now, the bulk of this silent interludes happened on his dad chair. 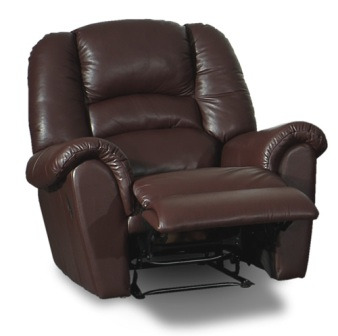 He had a typical La-Z-Boy leather recliner, positioned in front of the TV. When he was not working, he spent a great deal of time on this chair. It was a place of comfort, a throne, a perch from where he sat to rest or to take it all in. My mom would sometimes complain that he spent too much time there, being too silent or taking a nap. 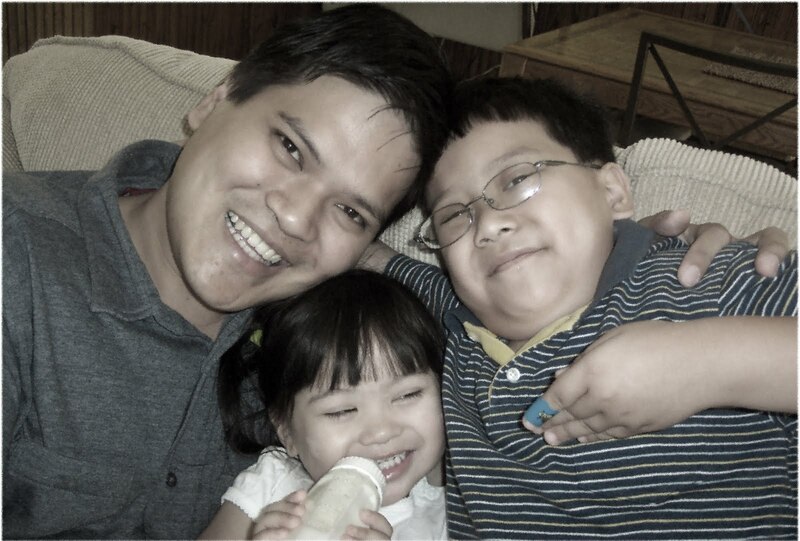 I think that my dad was just too happy and content, confident and in awe of the way his wife handled things, that all he wanted was to sit on that chair where he could admire the way our lives were unfolding before him. Raising a family is not only about growing children. Parents are raised too. Growing up is about watching what your parents do with their lives. My mom never seemed to stop moving. She was very physical; always working on something, making it clean, making it better, making it taste impeccable. She showed that not a minute of every day we've been given must be wasted, that every breath we take must be spent doing for the people we loved. My dad on the other hand, always seemed to be in pause and play mode. He works hard but never seems like he breaks a sweat. He was never ever too busy to be bothered by anybody in the family who needed his time. He always took his 15-minute breaks without fail (on his recliner). He showed that not a minute of every day we've been given must be wasted, that every breath we take must be spent doing what we loved. If my mom loves us by doing, my dad loves us being. What makes the daddy chair so iconic? Countless living rooms in the world have it. They mostly come in brown or black, preferably overstuffed. Over the years, the stuffing memorizes the shape of daddy's girth and back, and becomes ever more comfortable. Its promise remains the same; at the end of a long day, you dissolve in it, push the back to recline, crank a lever to put your feet up, and watch the world (or the game) go by. It's the one thing that wives allows to be in the living room rather than chooses. The one thing that didn't match. It's like a magic chair; you slide into it, lean back, and the thing for your feet would pop up. It's a bastion of comfort. Dads sit on it at the end of the day and let their worries slip away. Like a great recliner. 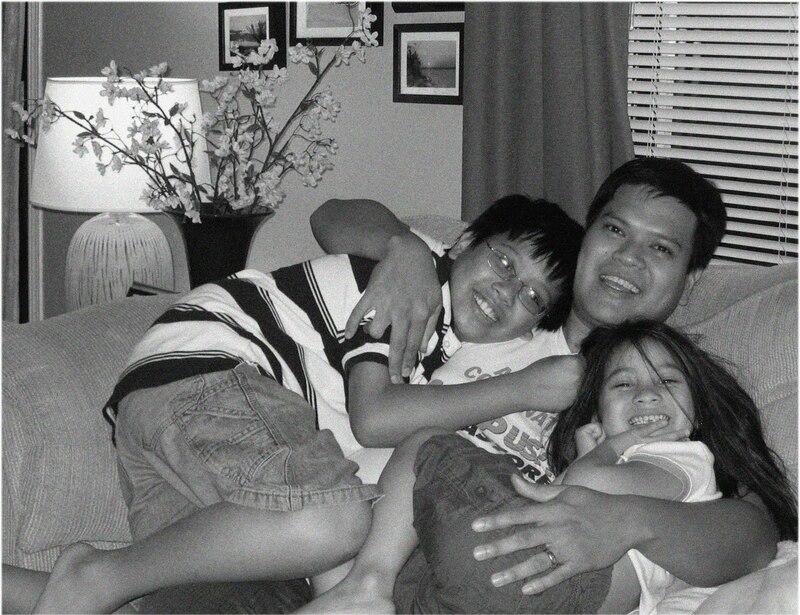 The kids get bigger, the couch and the dad get older. The comfort factor remains the same. In the home that I share with my husband and my kids, we do not have a recliner. Instead, we have an old, comfy couch in front of the TV in the family room, and on random nights when my husband would sit their with his feet up, that was a signal for the kids that says, "I'm home and I'm here." He is a big, tall guy, and when he sat like that, it was all the kids could do not to climb on him. And so they do, and stayed like that until it was time to move. He was a human recliner, big and warm and home at last. My dad shows me a lot about life just by sitting on his favorite chair. 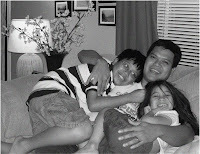 Oftentimes I find myself too caught up in the errands that needed to be ran, the chores that never seemed to get done. I find it hard to sit, lest I fall behind on my tasks. On the other hand, my husband does a lot for our kids just by sitting on the couch with them and sitting through their favorite cartoon. When fathers sit, they shows the kids that he is there, available to anybody with nothing better to do and nowhere else he would rather be. 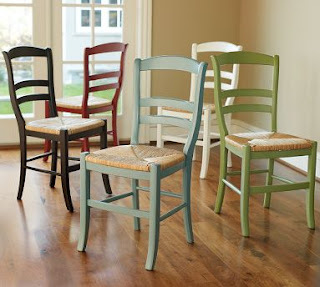 Buy the fathers a chair. Or understand when they have to sit. Happy Father's Day. 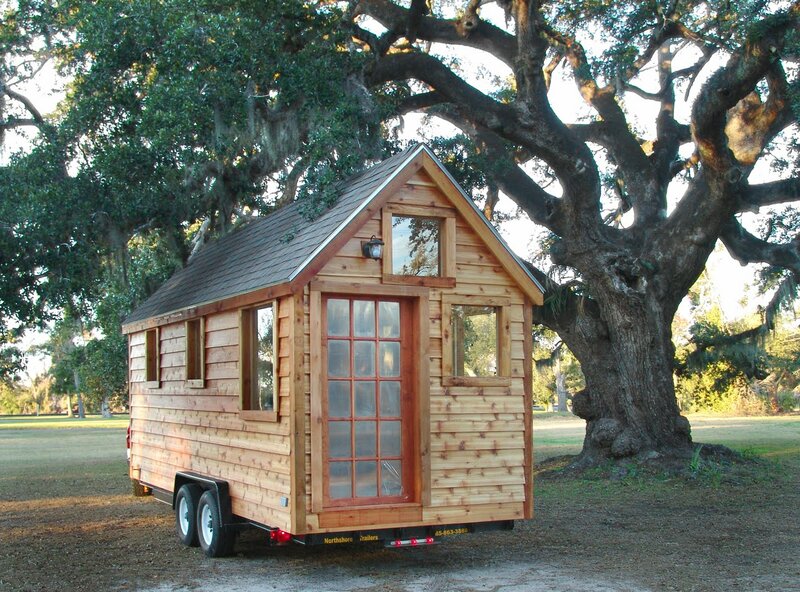 In the most elaborate and wildest of dreams, dream houses are almost never small. Real houses however, often are. As in most things we draw up in our minds, they tend to be bigger up there, until we execute them and find it not so easy, and so we modify and cut things down to size. In real life, most of us dream big so we can grow into them, but often we eventually find the grace and serenity to find contentment with what we end up with. Putting up with less than originally planned however, is not always easy. In urban areas, where more and more of us live today, space is the greatest luxury. Unfortunately, space is most expensive in places where the need for it is most acute. Urban life is a crowded affair where we spend lots of time in spaces with a shortage of mental and physical elbow room, such as being stuck in traffic in a car and a small office cubicle. While a cozy cabin is a welcome retreat after a hike on a windswept plain, a cramped, pinched space is hardly the haven we want after crawling through the rush hour. Smaller spaces though, are the reality of our time. Practically speaking, they are more cost-effective to run and maintain in terms of heating, cooling, lighting, cleaning and furnishing. They are more ecologically and economically sound. Rather than a compromise, it can be a choice. In urban areas, where more and more of us live today, space is the greatest luxury. There is a saying that goes, "Nature abhors a vacuum." 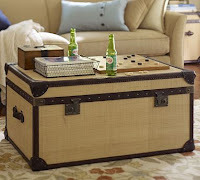 Even a large house, if not laid out well and filled with unnecessary junk, can feel cramped. There is a sort of unwritten domestic law whereby clutter will tend to expand to fill the space available. Therefore, in a good way, small spaces challenge us to avoid mindless accumulation and decorating in a piecemeal fashion. Every little object that comes into a small space has a magnified effect, and so we need to give more thought into what we buy. The instant approach to decorating (often seen on television makeovers) obscure the advantages of selecting better materials that will not only last longer but matter to us longer. 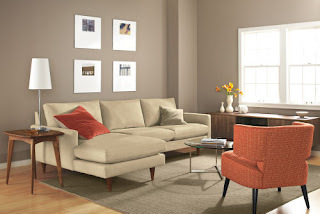 Small spaces need not cramp your style. They just require a greater degree of decorative uniformity throughout to keep visual distractions to a minimum. 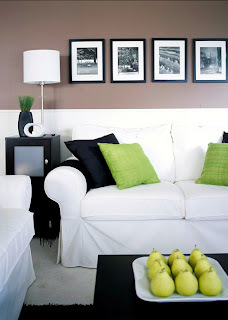 For instance, painting small spaces in light, mostly monochromatic hues is a tried and tested approach. 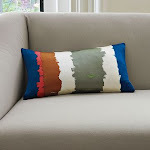 When choosing color, one or two surfaces in an accent color is enough to add just enough punch to a mostly neutral interior which can be otherwise bland. 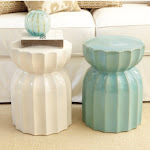 Using it as an accent is the simplest way to add color to a small space. Another technique is to repeat a color in small doses from area to area. The blue in the kitchen can appear in the bathroom tiles, or on some pillows thrown on the couch. 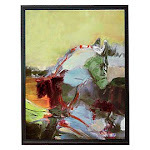 This connection will link areas together in a subtle fashion that creates an innate sense of harmony. Every little object that comes into a small space has a magnified effect, and so we need to give more thought into what we buy. 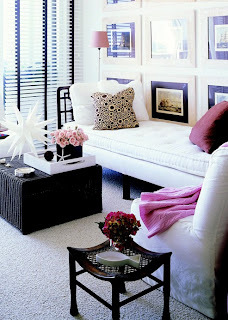 Above, right and below: Neutral colors, minimal punches of lively colors and well-edited decor work in a small room. If you can see a little bit of the floor, the room will look larger. "Visual weight" is just as important as actual weight. 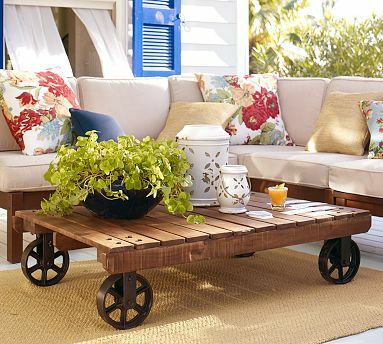 Armless chairs, glass tables, and sofas that show their legs take up less "visual space' than large overstuffed pieces and heavy wooden furniture. Left and Below: Abundant light coming from an undressed window, light walls and "open" furniture open up the room and make it look larger. Our experience of space is not static. Having a few good-size to large key pieces in a room is better than a having a lot of tiny small pieces that end up looking cluttered. 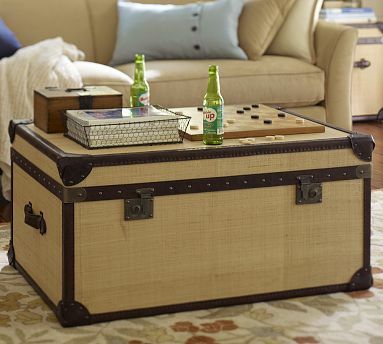 A well-edited selection of only the most essential pieces of furniture, touched up with the most tasteful of accents can make even a room look larger and more dignified. 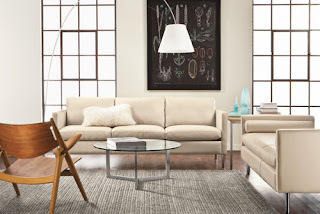 Floating furniture arrangements in the middle of the room creates a sense of space around it. Our experience of space is not static. This means that our perception of a room as large or small does not develop while merely staying put. As we move through a space, our experience of walking through it can either enhance or diminish its size in our minds. If there is a lot of obstruction, we may view the space as cramped. On the other hand, a loft-like open atmosphere, heightens our sense of space. If we can move easily through a room, it will seem bigger. Assess how you move through your spaces. Are there tight corners where you feel you have to squeeze past? Improving circulation by simply removing extra furnishings does wonders for a small space. In the 70s, there was no Google. If you wanted to know about something, you either asked your folks or you crack open a book. In the 70s, there was no Wii. If you're really bored at home you either go out and play or you crack open a book. In the 70s, there was no Nintendo DS. If you're on a long car trip, you either talked to your folks or you crack open a book. The possibilities weren't endless as they are today and I mostly chose the latter. Ever since I can remember, books were the one thing that truly held my fascination. I was quite a bookworm, and I on those days when I was not in school, I thought that there was nothing else I needed as long as I had some food and several good books to read. Whatever books I owned I read in their entirety. When I was six, my mother bought me a wonderful collection of an illustrated children's encyclopedia called, "Childcraft." It had 15 volumes in all, and I read them all, including the Parent's Guide. When I had exhausted that I moved on to our neighbor's Disney Encyclopedia, and their collection of Dr. Seuss books. I was allowed to check out several books at a time, or hang out in their family room and read. By 6th grade, I had read nearly all of the Nancy Drew Mysteries and had sampled a few juvenile romances. In high school I mostly stuck to the reading material for literature class, including Greek and Roman mythology, read a few Jane Austens and suffered through epic poems like Beowulf. During college I discovered Sydney Sheldon and because of that went on a crime-mystery phase that lasted through my mid-twenties. Around that time I had my son, and if there ever was a person I knew who loved books more than I did it was him. It was fascinating to watch, the way he was just drawn to them. It was like food and water to him, and even as a baby, he was insatiable. We could go on for hours reading book after book, and he would not tire of them. Thus the books came into our home, slowly but surely. By the time he was five and I had my daughter, we were moving into another home, and while packing our things I realized we had more books than anything else. If I kept them all they would probably fit an entire wall. However, I have always weeded the shelves out to make room for new ones. The baby books are long gone, and so are the Sheldons, and the Danielle Steels. You get savvy and more discriminating after a while, and you come to know that the Paul Coelhos, Mitch Alboms and Toni Morrisons make a better collection. I make sure I have on standby a few classics like Austen, Thoreau, Whitman and Dostoyevsky, because like always having fresh fruit on the kitchen counter, a mother has to make sure of this, just in case one day the children decide to reach for them. If you have not discovered it yet, great books, like good food, are nice to have around. They make cool personal statements of taste (and intellect), can be really colorful, and take up a lot of space. 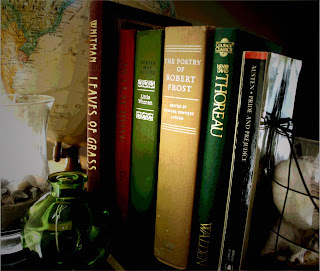 Thus if you don't have much in the way of art or knick-knacks, books make great decorative items too. 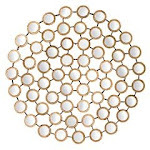 You want to keep and arrange them in a way that is attractive and accessible. The key words are balance, organization and visual interest. 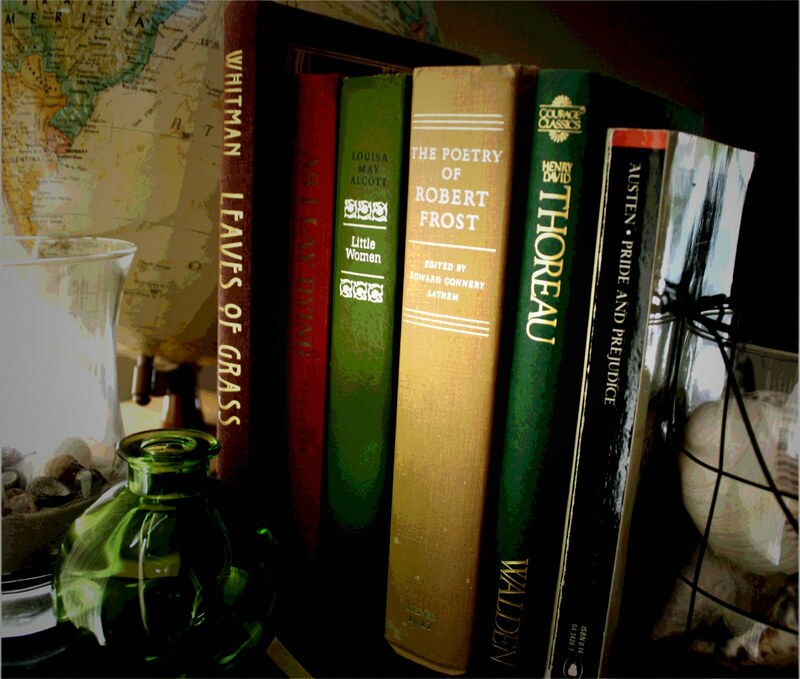 The most interesting look is to stack a few books horizontally, then place a porcelain plate or small framed drawing on a stand on top of the books. 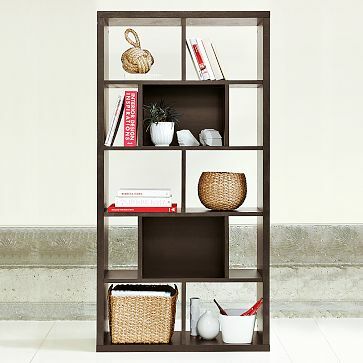 Try to vertically fill the shelf, pulling the items and books forward toward the front edge of the shelf as you go. Always bear in mind that you need to be able to easily pull a book from the shelf when needed, yet, arrange them in a way that is visually appealing. A zigzag approach also is effective when arranging shelves. Tracing the letter Z, place a large accessory at the upper far left position of the top shelf. 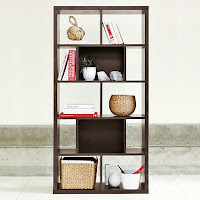 Then place another large object on the opposite, or far right position on the next lower shelf. Beneath that shelf, place a dense object or stack of books in the far left position, until you have zigzagged your way down the shelves. 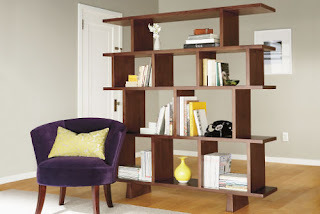 Reverse the zigzag pattern on the adjoining or flanking, set of shelves. Lastly, fill in the Z-shape you have established with alternating stacks of visually dense accessories or stacks of horizontal and vertical books. Making a full row of books on a shelf or several shelves is called the library look. This is also a great look. It's hard to beat the look of books lined up neatly. It creates a warm, inviting and cozy atmosphere. One feels compelled to sit down and read. Pull this look together by placing similar items together. Separate paperbacks from hard bound books. 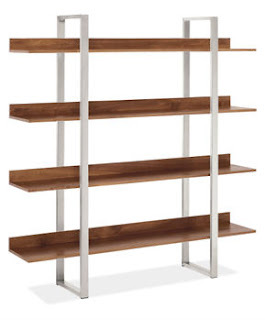 Put the largest and tallest books on the bottom shelves to anchor the bookcase. Vary the heights with the tallest books in the middle of the shelf and don't place tiny books next to tall books. Descend in gradual increments. Putting a row of encyclopedia books that are all one color and style on a bottom shelf is a great way to anchor the bookcase. It also brings a lot of unity with the repetition of the books. 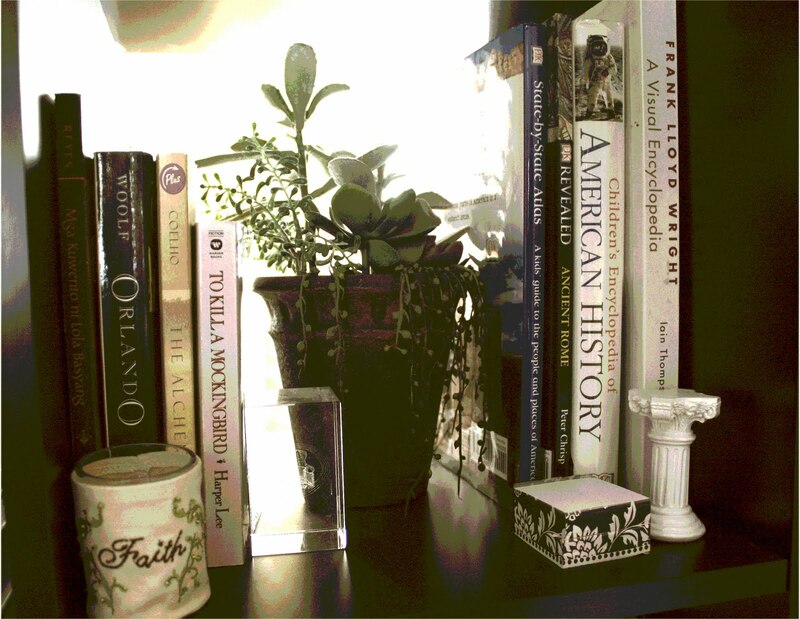 Place your most attractive books at eye level. Leave some room between displays of books or other items. 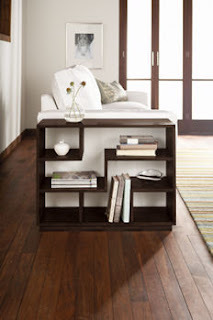 Small amounts of space give the eye room to breathe, and allow the beauty of your books and collectibles to shine. Introduce items other than books! 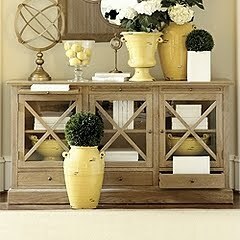 Collectibles, small potted plants and framed photos add character and interest as well as texture and color. 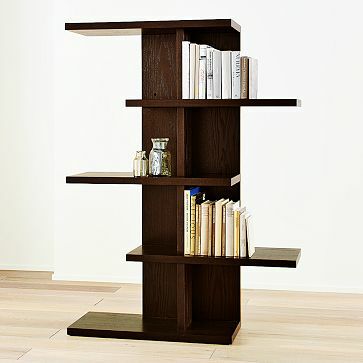 These bookcases are design objects in themselves. Buy, borrow (or download). Here are links to the new top reads. My next top picks out of this list are 'Eat, Pray, Love.' 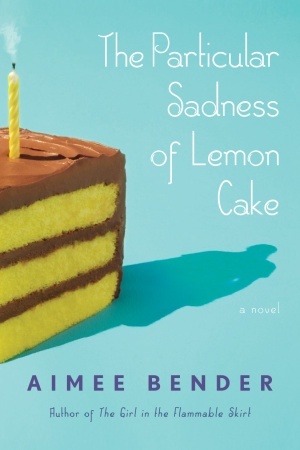 by Elizabeth Gilbert (so I can see the film soon to be released), 'Blink' by Malcolm Gladwell and 'The Particular Sadness of Lemon Cake' by Aimee Bender. The new way to do country is to take it uptown. Say goodbye to roosters and red-checkered cafe curtains and say hello to sophisticated country decorating. The modern way to do country is to mix things up. Sleek, contemporary lines and finishes mixed with the warmth and casual charm of traditional country makes for a look that is homey yet stylish. 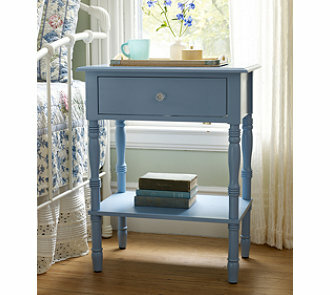 When going for this look, you cannot go wrong with painted furniture. They are fun, colorful and not to mention, a cinch to refinish. Warning: Unless it's for a little girl's room, stay away from anything that says, "cute." 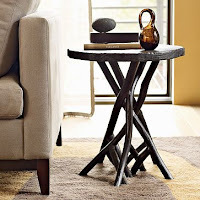 Anchor painted pieces with dark wood finishes. Country casual is all about lightness and fun. 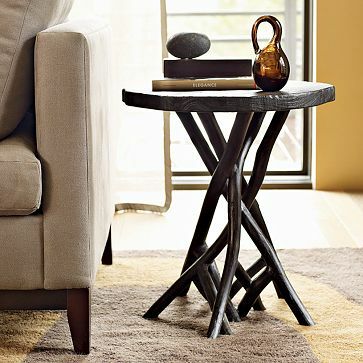 Look for unexpected twists and shapes on furniture. Take your country for a downtown spin. 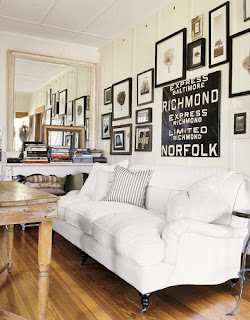 A black and white and mostly neutral interiors quickly relaxes when roughened up with beautiful distressed pieces. Select a few key pieces that look like they've been around forever. 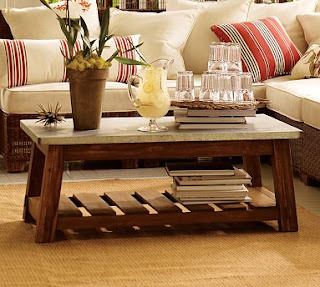 If distressed is not your thing, opt for bare-look wooden furniture that have a 'found object' appeal. Rather than resorting to themes that can quickly become dated and tiresome, the use of natural materials can create a rustic and relaxed country atmosphere. Summer is here and you know what that means. Labor Day weekend traditionally kicks it off, and last Sunday in my neighborhood was a sensation extravaganza comprised of the sounds of people partying, pool water splashing, the slight heat of 80-degree temps, and most of all the smell of fire-grilled meat. They say that barbecuing is one of the last few primal traits leftover from our caveman days, that of charring the kill over fire and sharing it with the tribe over much fanfare. No wonder a lot of men like to do it so much. 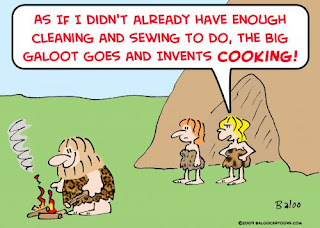 When I read about and think about the history and evolution of cooking and kitchens, I can't help but notice that it all began with the men doing the cooking. The world was lit by fire, and even at the dawn of the 20th century, kitchens were nonexistent. Cooking was an outdoor affair, done on an open hearth where sparks tended to fly. Then the men realized that they had much better things to do, and along with further civilization and settlement, kitchen outbuildings were put up. They were kept at some distance from the house because the cooking would sometimes end up in flames and burn the main house down. Cooking then was a hot, flaming endeavor that took hours as every single ingredient had to be made from scratch. If you did not render the fat, mill the flour, dress the chicken and smoke the pork leg ahead of time, you're cooked. Fast forward to the present time. Let me first state that designers and architects often are asked to create elaborate, state-of-the-art, often-enormous kitchens for clients who didn't cook! 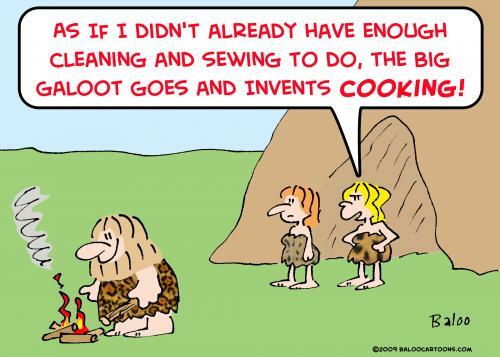 This says a lot about the leap and change that kitchens have made over the years in terms of function and cultural significance. Nowadays, cooking can be a breezy affair, consisting of opening packages (or takeout boxes) and pressing buttons, with absolutely no flames involved. In Colonial America during the 17th century, a kitchen contained a trestle table or bench, a storage chest, a cupboard and had wooden floors sprinkled with sand, which helped absorb odors (Source: NKBA). Today, the kitchen is easily the most appointed room in the house. Even if all you have to do in a day is make coffee, smoothie and heat frozen food, that's three appliances already, not including the refrigerator. The social dynamics of the kitchen has also greatly changed. From mere outhouses, kitchens slowly moved into the interior of the home with the invention of coal and gas stoves sometime during the mid-19th century. They were mostly moderately-sized rooms separated from the rest of the house, sometimes with no windows and used primarily for cooking. All eating and socializing happened in the living and dining room (those rooms that come in handy during the holidays). By the end of the 20th century, the kitchen had evolved into a complex area, where mostly all the daily family home activities happen and where now guests are free to hang out. The kitchen is the place to be--to cook, eat, watch TV (got AT&T U-verse? ), do homework, pay bills, socialize and entertain. So it is that the kitchen is now the social center of the home, and truthfully has made the living room and the dining room a place we rarely visit. I have noticed at parties that these two rooms tend to contain certain types of guests; overflow from the kitchen/great room area, shy wallflower types, the uncle who likes to take an afternoon nap, and teenagers who think the adults are too noisy. Everybody else likes to hang out in the kitchen (all the cool people are there and also because you don't have to travel so far for seconds). The kitchen island is an effective social catalyst, the center of the action, where a host can continue to cook while regaling the guests on the other end. Not unlike a bar at a restaurant, a kitchen island holding a buffet of food seems to have the power to loosen everybody up and start conversations going. For people who like to cook or have to cook like me, the kitchen is command central. It's the part of the house I spend the most time in. It starts in the morning and grinds its way into evening, with periods in between when I summon my 'staff,' to check on what they're doing, interrogate them about their day, and inevitably offer them food. It's a safe haven, where I can get lost in pasta and cake batter, and where I can't be blamed for not responding to cries for help because I cannot hear anything over the hum of the range hood. I am all for the advancement of the kitchen as the best room in the house. My extended family is happy to hang out in our great room for the rest of the party, all the better to be closer to the food and be handy for cleanups. For several hours, my kitchen/great room transforms from my own quiet corner of the house into party central. I love it. Great food and all the people that matter, all in one room. However, the daily grind can be too quiet. I notice that my kids would make brief appearances when I yell, "Food!" then put their dishes away and then magically disappear. We talk over meals and then I am suddenly alone again. Too quiet again. If I wanted to see and hear more of them I would have to hunt them down, but there's more work to be done in the kitchen, and frankly, I did not want to leave. Then one day, I thought of bringing in some background noise by installing a small TV. At least while doing dishes, I can 'hang' with Vanna White and the guys from Law & Order. It was perfect, but Vanna and Lennie Brisco did not stay for very long. A few days after I bought the TV, guess who lingered loooong after the dishes have been put away. Yes, my hubby, my kids, and some characters from ESPN and the Cartoon Network. Kitchen wonders indeed.